Chocolate and peanut butter come together to make easy, fall-inspired Chocolate Acorn Cupcakes! The official beginning of fall is just around the corner (even if Facebook thinks that begins sometime mid-August.) 🙂 For me, it’s a bit too soon for pumpkins and turkeys, but September brings apples and acorns to mind. 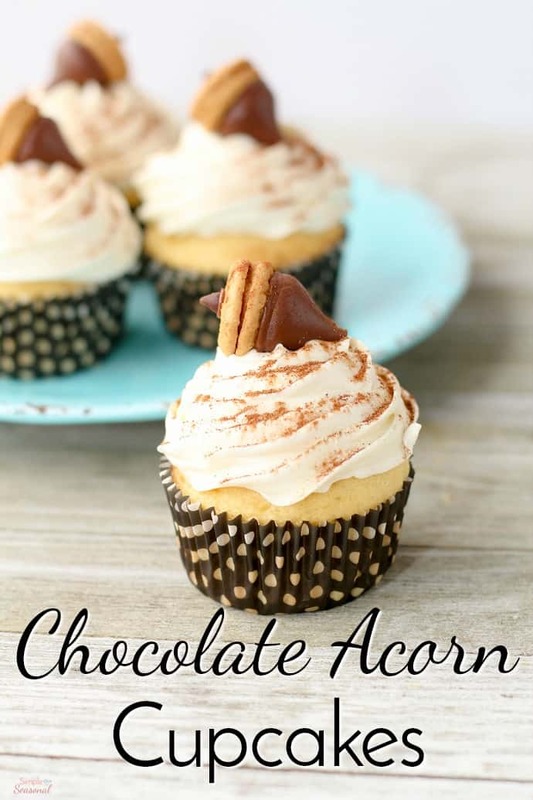 What better time to whip up a batch of these adorable Chocolate Acorn Cupcakes? I have a cute set of tip towels in my guest bathroom that I pull out every year. One is a light tan color with an acorn embroidered on it. (September) The next one is bright orange with a pumpkin (October) and the last is a dark brown with a turkey. (November) So I guess my fall schedule comes from a set of towels from Kohl’s. Ha! I’m so cutting edge and stylish. 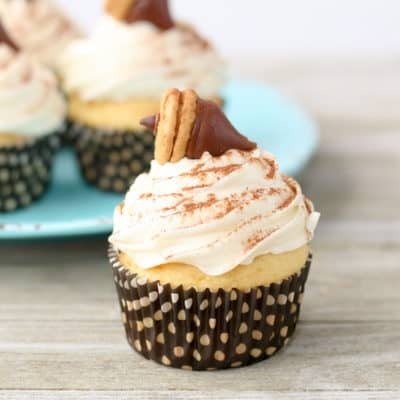 You can make Chocolate Acorn Cupcakes with any kind of cake mix or homemade batter that you like. 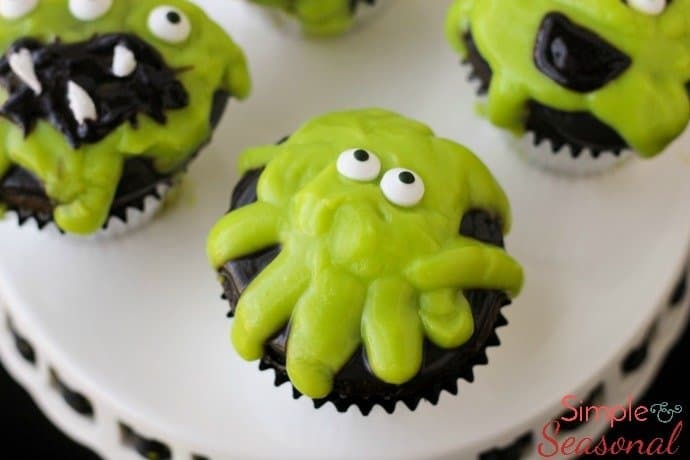 The fun thing about cupcakes is frosting and decorating them, anyway. 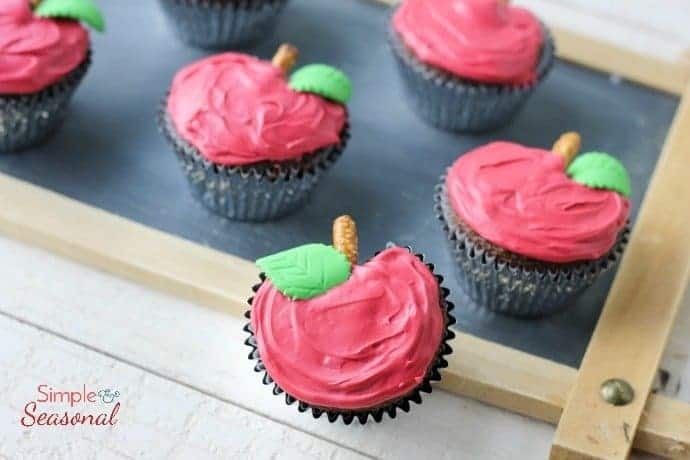 🙂 If you REALLY want to make things easy on yourself (think class party or work event) then just buy a batch of cupcakes from the grocery store bakery. The little touches you add will personalize them and you won’t spend all day in the kitchen! 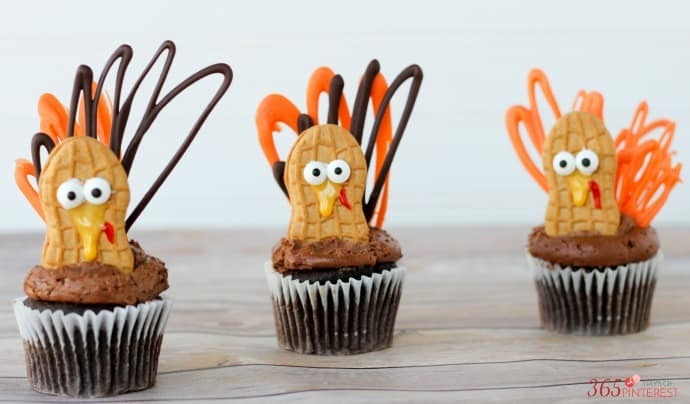 You can click on any of the images to see how to make the other fall themed cupcakes. Now, back to this year’s choice: Chocolate Acorn Cupcakes! Gather your supplies to make the chocolate acorns. You’ll need Hershey’s chocolate kisses, Nutter Butter bites and mini chocolate chips. 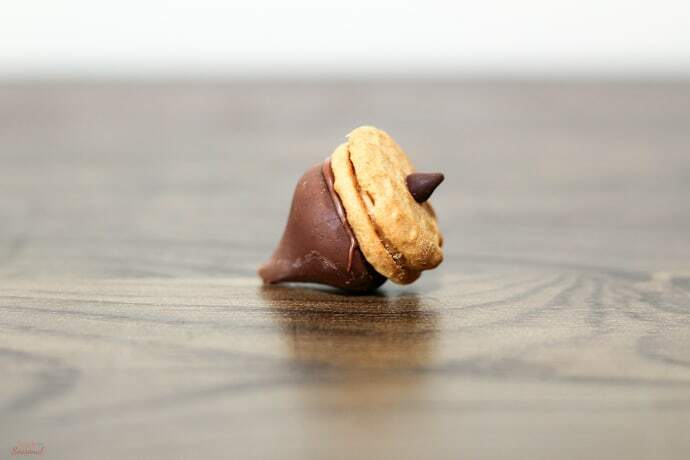 Melt down some of the chocolate chips, then dip the Kiss into the chocolate and press onto a cookie bite. Freeze to set. Once again, use the melted chocolate to attach a mini chip to the other side of the acorn. Freeze to set. 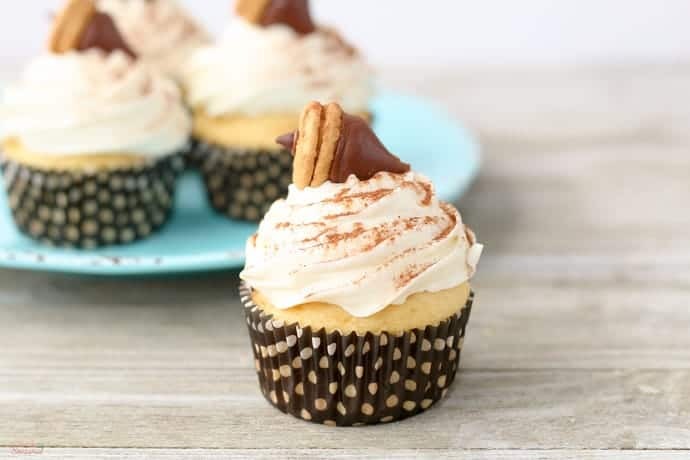 Place on top of your finished cupcakes and serve! They are so cute and delicious, too. Prepare cupcake batter according to box instructions. Line muffin pan with liners and fill each a little over half way. Bake cupcakes according to box instructions, and let cool completely. Once cupcakes have cooled, ice each one with icing of your choice. Sprinkle lightly with cinnamon and set aside. Now prepare your acorns. 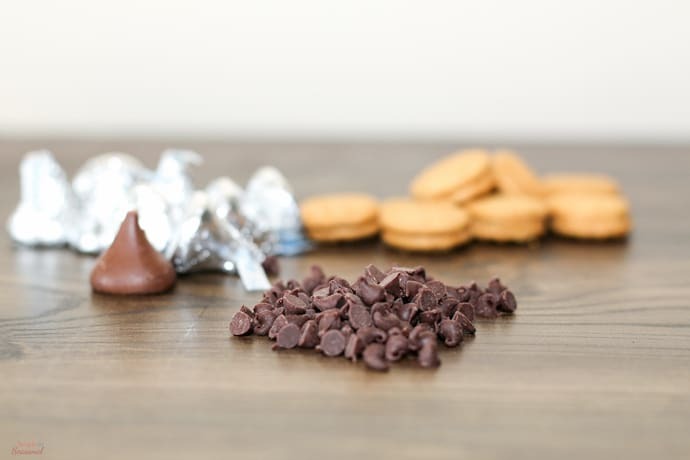 Melt down one cup of chocolate chips in the microwave and set the rest of the bag aside. Microwave in 45 second intervals, until melted. 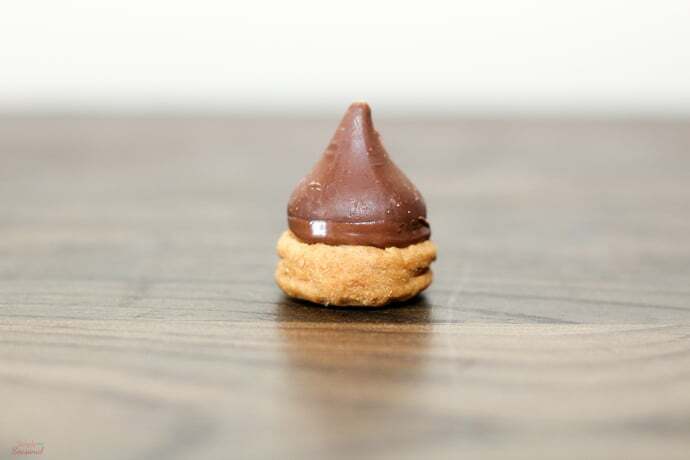 Dip the bottom of each Hershey Kiss into the melted chocolate and place on top of one Nutter Butter Bite. Place in freezer and let set. One set place one drop of melted chocolate on top of your Nutter Butter and add one mini chocolate chip. Place in the freezer once more and let set. Once entire "acorn" is set. 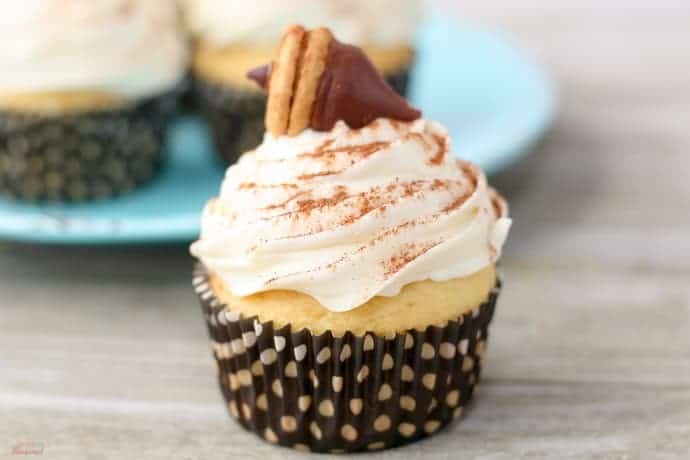 Place on top of your prepared cupcakes. Don’t forget to pin them for later!